The booklet is a compact source of clear and simple best practices to deans and heads of departments that aim to increase the participation of women as both students and employees in their institutions. Many tips included were also inspired by colleagues already in leading positions who have already implemented actions in their institutions to attract more women and ensure their continued participation in the organization at commensurate ratios with their male colleagues. The booklet is endorsed by the European Commission and features a foreword by Neelie Kroes, Vice-President of the European Commission, responsible for the Digital Agenda. Hardman, L, & Pereira, C. (2013). 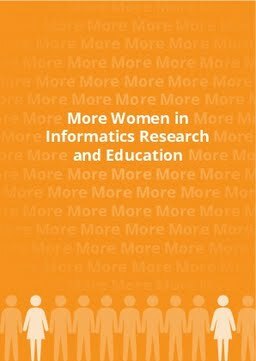 More women in informatics research and education. Informatics Europe Women in Informatics Research and Education working group.